Finding that the washing machine won’t drain water can seem like a big problem that brings up the thought of having to call a repair man. But it actually isn’t. Either something is caught in the drain hose or pump, or the pump has malfunctioned. Even if you aren’t too savvy with tools, a problem such as this can be easily solved. But other than a washing machine being annoying, it is possible for the washing machine to overflow and leak water around the machine. At any time when finding significant water damage on the floor or walls, don’t hesitate to call a water damage restoration professional. As soon as the water stops flowing into the area, these professionals will be able to quickly extract the water and dry out the affected building materials. If you still have the troubleshooting manual that came with your washer, pull it out and match the error code on the machine with the one written in the book. While many washers operate similarly, brands will have different codes that have different meanings. But if the machine doesn’t provide you with code or you don’t have the manual, not to worry. You’ll just have to do it the old-fashioned way and manually find the problem. The most common problem with washing machines not draining is a clogged drain hose. To access it, remove it from the back and run a moderate amount of water through it. Make sure you are ready with a bucket to prevent water damage on the floor. If the hose was the problem, this process should force out the debris. Replace the hose. If the hose is leaking or is tight around a certain area, you will have to replace it. When installing a new one, make sure that it isn’t more than 8 feet from the floor and it doesn’t run any longer than 4 and a half inches into the drain hole. The hose should also neither be bent or kinked or nothing blocking the water from coming out of the drain hole. These factors will all have an effect on the drain time. After forcing out the blockage from the hose or replacing it, run the spin/rinse cycle on the washer. If it drains normally, the problem is fixed. But if not, not to worry. There is another fix. If the problem isn’t with the drain hose, it lies with the water pump. First make sure that the washer is unplugged and then find the pump on the machine. If you have a top loading machine, it’s in the back. For front loaders, it’s in the front just below the door. You will have to unscrew the front cover to get to it. As soon as you find it, you will see a round section with a white, plastic oval-shaped handle. Pull it out carefully. To remove the screen, turn the handle counter-clockwise and apply some pressure. Just make sure to do it over the sink or a bucket as water may come out. But inside, go ahead and remove the debris causing the clog. Make sure nothing is caught within the screen by feeling inside the hole to the right of the screen. Also make sure that nothing is caught on the fan pump. Finally, replace the filter, turn it clockwise until tight, and then replace the other panels. Just run the rinse/spin cycle again and you washer should drain quickly. If not, the washing machine will need to be replaced. But if not, then you can call a repair man. Even then, the bill shouldn’t be too high. 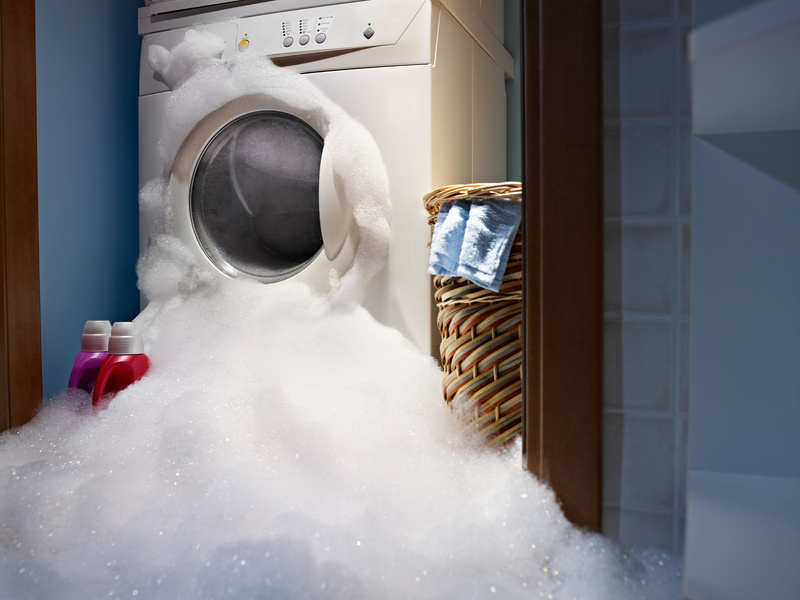 While dealing with washing machines that aren’t draining properly isn’t too significant of a problem, dealing with an overflowing machine can be disastrous. Especially if it has been left alone and leaking water everywhere, the damage can spread through the walls and floors. In a situation such as this, first turn off the water supply by turning off the main shutoff valve. Then call a professional water damage restoration service. One company that is available 24/7 for all water damage emergencies is ServiceMaster. Their technicians respond immediately to these situations as they know water spreads by the second, affecting additional materials and prolonging the cleanup process. As soon as they arrive, they will set up professional equipment to extract all excess water while drying out the affected area. They can also work with your insurance company during the claims process to allow for as much peace of mind as possible. Within a few days, you can look forward to a fully restored area.